My passion is the creation and design of contemporary, couture jewellery. However another creative outlet I adore is my garden. The organic richness and fluency of plants and their precious blooms often inspire me during the creative process. To be away from the studio and engulf myself in the outdoors is at times refreshing, inspiring and allows free ideas to transpire. 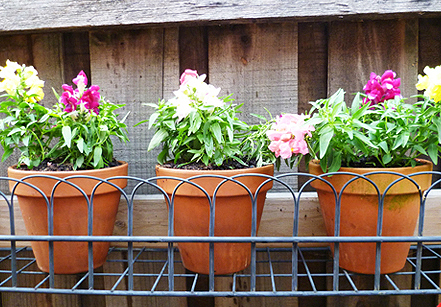 A pic of some recent snap dragons I have added to my garden sitting in french inspired terracotta pots.